Phil Kirby already has a Grand National candidate this year in Blaklion – but is hoping next year’s race contains Top Ville Ben after he put an unfortunate incident at Cheltenham behind him in fine style at Wetherby. While the seven-year-old was considered an outsider by most in the RSA Novices’ Chase last week, Kirby was confident he would outrun his odds. Unfortunately, Top Ville Ben never got the chance to prove his trainer right when falling at the sixth fence – but he showed no ill-effects when bolting up back in Yorkshire less than a week later. 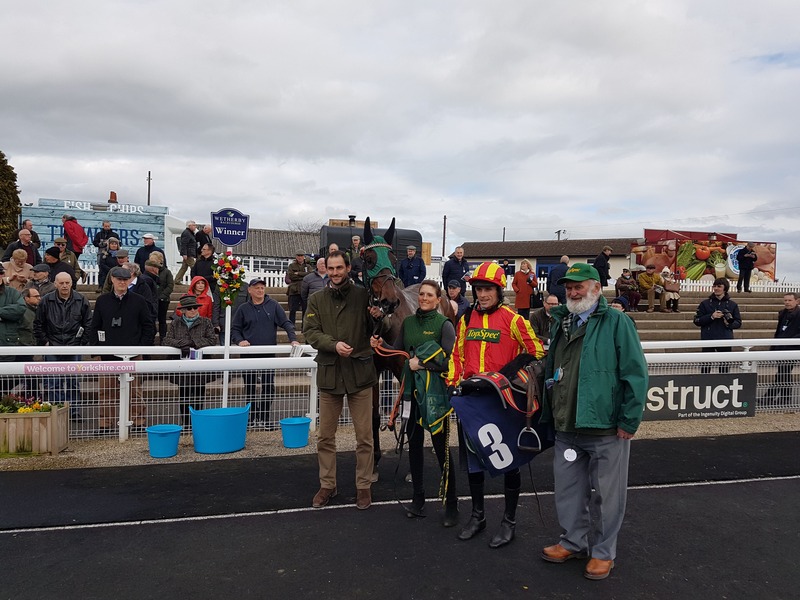 Kirby is ahead in the race to be top trainer at the track this season, helped by a notable double on Charlie Hall Chase day from Lady Buttons and Nautical Nitwit, and Top Ville Ben already had a course-and-distance win to his name. Sent off the even-money favourite for the Racing TV-sponsored event, Sean Quinlan pressed on in the second half of the contest and saw off the attentions of Louis' Vac Pouch before strolling to victory. With Louis Vac Pouch and Noruki coming down two out, it was left to Sam's Gunner to chase the winner home – some 37 lengths adrift. “That was really good, and we’re back on track again,” said Kirby. “He jumped brilliant – he was just too brave at Cheltenham, unfortunately. “I wanted to school him straightaway, and I did yesterday, and this race came up – which if we wanted a run before Aintree, as I did, was realistically his only option. “He’s very talented. I thought he had a real each-way chance at Cheltenham. He was good today and will go for the three-mile novice chase at Aintree (Mildmay Novices’ Chase). Amateur rider Shane Quinlan was taken to Harrogate Hospital for x-rays on possible leg and collar bone injuries after his fall on Noruki. Sean Quinlan later doubled up on Border Victor (3-1 favourite) for Barry Murtagh in the Peter Harper 60th Birthday Celebration Novices’ Handicap Chase. Minella Warrior, who narrowly missed out on getting a run at the Cheltenham Festival, recorded a hard-fought victory in the racingtv..com.com Handicap Hurdle. Kim Bailey’s seven-year-old was second reserve for the Pertemps Final but travelled north instead to justify 2-1 joint-favouritism. Bailey’s assistant Mat Nicholls said: “The form of his Pertemps Qualifier couldn’t have worked out better, with the horse of Jessica Harrington’s (Not Many Left) nearly winning the final. “Annoyingly, he’s gone up 3lb retrospectively this morning, and that would have been enough to get him in. “We could have gone to Kempton for the consolation race. But he needs three miles, and that was over two-five. Micky Hammond was full of praise for 7lb conditional Billy Garrity after he got an eighth career win out of Caraline (4-1) in the Watch Irish Racing On Racing TV Handicap Chase. “She’s not had her ground this year really, and has dropped in the weights as a result,” said Hammond. Chris Grant took the opening two-mile handicap hurdle with Theatre Legend (9-4 favourite), who won confidently under Brian Hughes. “He’s a nice type. He’ll run again this year, but his future is over fences,” said Grant.